As chess manufacturer, we also accept special order from our customer who want to order their own chess design. For this special design from the customer, we will apply the customer design into our chess pieces. We called it as Custom Chess. We also have some custom chess design. Examples, which can be seen in our galleries, are of ancient man, animal, soldier, geometric design, fictional figure, log, etc. Here you can also get an idea of customized Chess products that you yourself may wish to design and have created by us. This time, we show you about one of our custom chess collection that is the Kingdom Theme chess piece. 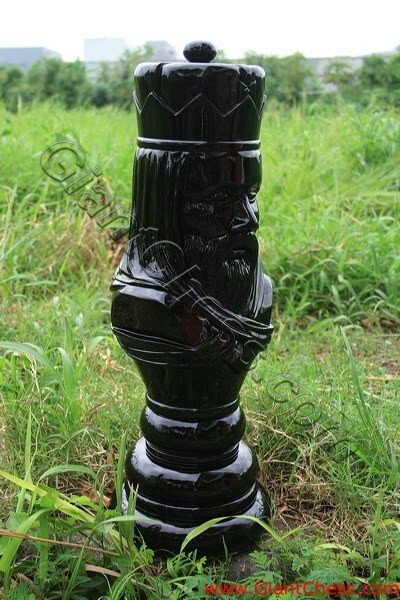 This King chess piece looks more suitable for decoration use than for chess game. Made from Teak wood and carved by talented craftsman, the custom chess piece is unique handmade product. Try to put it on your living room table to make it looks more incredible.